This morning the brilliant Novaa Veo commented on one of my "thought direction" posts. She mentioned that my posts were inspiration for the spells she uses while doing energy work at her altar. How magickal and amazing is that?! I realized -I- should be using my posts as spells while doing energy work at my altar! But first: to make the altar! I've always loved ritual and it's always worked for me. Why I haven't been doing a daily ritual with magickal objects at an altar is completely beyond me! But there's no time like today to start. 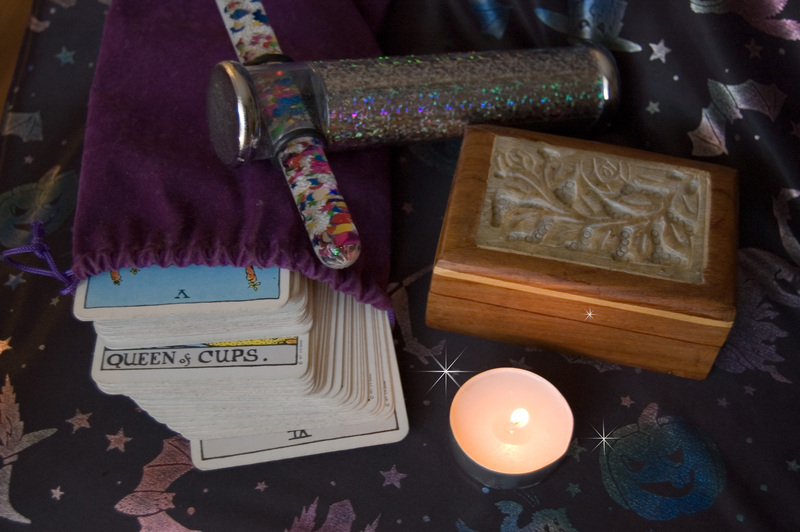 I gathered my most useful tools: a kaleidoscope, a deck of tarot cards, a tea light and a cozy wooden box. I began to fill the box with objects that called to me, knowing they would guide my ritual. I dusted the bottom with gold glitter and admired my new treasure box! To begin, I light the candle. I take a peek into the kaleidoscope and pull myself into the Now (it helps to whisper "Now. Now. Now."). I breathe in and bring light into my crown chakra. I breathe out and activate my crown chakra. I breathe in and bring light into my third eye chakra. I breathe out and activate my third eye chakra. I breathe in and bring light into my throat chakra. I breathe out and activate my throat chakra. I breathe in and bring light into my heart chakra. I breathe out and activate my heart chakra. I breathe in and bring light into my solar plexus chakra. I breathe out and activate my solar plexus chakra. I breathe in and bring light into my navel chakra. I breathe out and activate my navel chakra. I breathe in and bring light into my spine chakra. I breathe out and activate my spine chakra. I shuffle the tarot cards and pull one out. This card sets the tone for the ritual, helping me remember the big picture of what I'm doing. Today's card, the 5 of swords, reminds me that I need to take care of myself, but also serve the greater good. An excellent omen for my new practice! 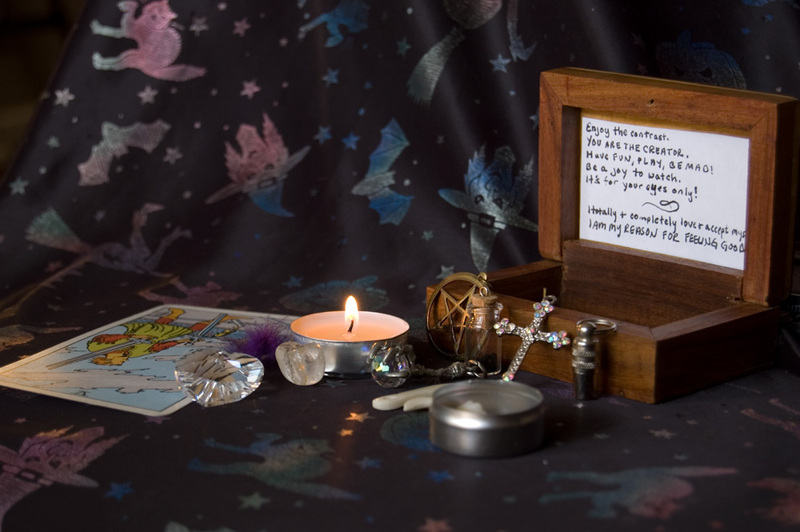 After the tarot reading, I open the box and read the card taped to the lid. "Enjoy the contrast. You are the creator. Have fun, play, be mad! Be a joy to watch. It's for your eyes only. I totally and completely love and accept myself. I am my reason for feeling good." I begin pulling items out of the box, repeating an affirmation for each object. A. Feather: I am light. B. Claw pendant: I let go of my resistance. C. Clear gemstone: I am magickal. D. Heart crystal: I love myself. I am my reason for feeling good. I project love and serve the greater good. E. Fish hook pendant: I honor my body. 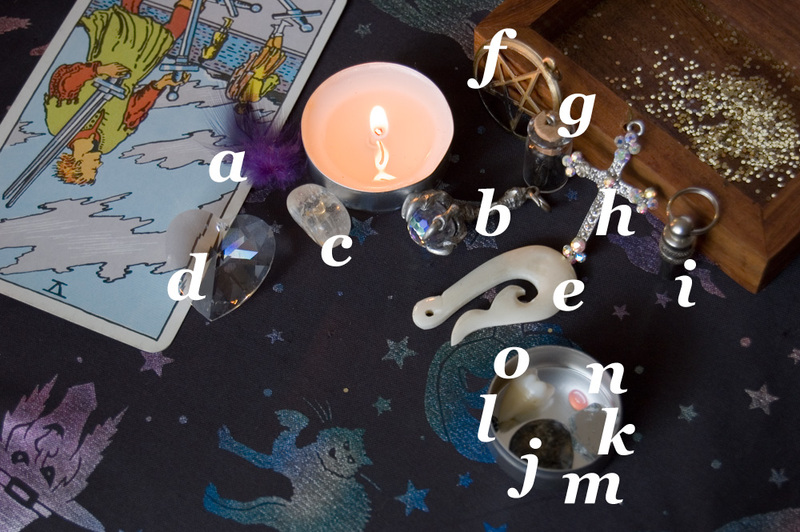 F. Pentagram: I am abundant in every way. H. Cross: I am evolving into Christ consciousness. J. Gratitude stone: I am grateful for _______. K. Mirror shard: It can only reflect me. L. Hematite bead: I am grounded. M. Hemp seed: I am becoming. N. Pink stone: I thank all those who have helped me come this far. O. Wisdom tooth: I remember my mortality and resolve to live this day to the fullest. After my affirmations, I do a few rounds of EFT about any resistant thoughts I may have. "Even though I ________, I still totally and completely love and accept myself." I spend a few moments in a meditative state, feeling for my inner body. And with that, I'm done! I do a quick grounding spell to release the energy I have gathered: "I now ground this energy that hasn't been used and return it to the earth. Thank you for helping me." What kind of rituals do you use? What are your magickal implements? I'd love to hear your own process! A Spell for the Best Day Ever!